We have gained expertise in delivering a quality range ofÂ Disposable Bouffant Cap. Disposable Bouffant Cap is fabricated under the surveillance of experts using advanced technology. Disposable Bouffant Cap is ultrasonically sealed and prevents less movement of hair during surgery. Disposable Bouffant Cap is completely sterilized and ready to use. 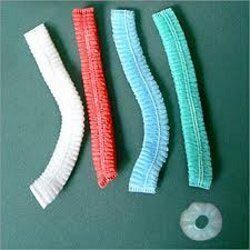 Our valued clients can avail Disposable Bouffant Cap in different head sizes.